New Holland offers the Boomer deluxe compact tractor series and the Workmaster line of value compact tractors. 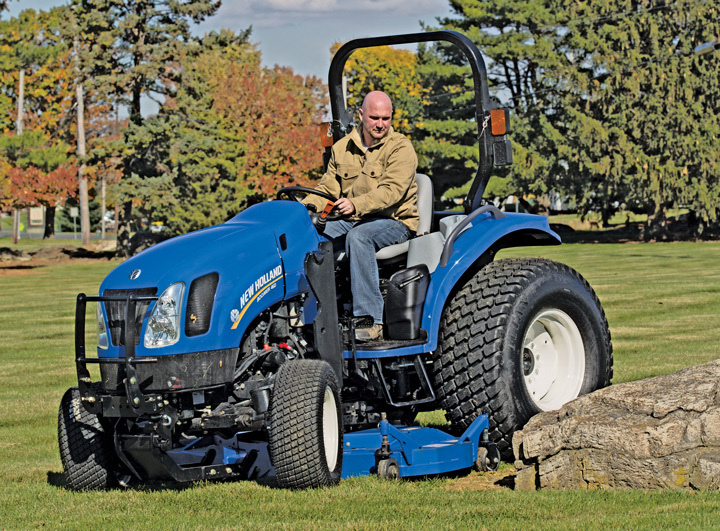 New Holland’s Boomer 24 to 54D deluxe compact tractors are a powerful tool for homeowners, rural life-stylers, landscapers, farmers, golf courses and municipalities. The deluxe Boomer compact tractor line includes seven models ranging from 24 to 54 hp. The majority of these models provide plenty of choices, including cab (excludes Boomer 24) or ROPS platforms, gear, hydrostatic or CVT transmissions (excludes Boomer 24) and ag, turf or industrial tires. 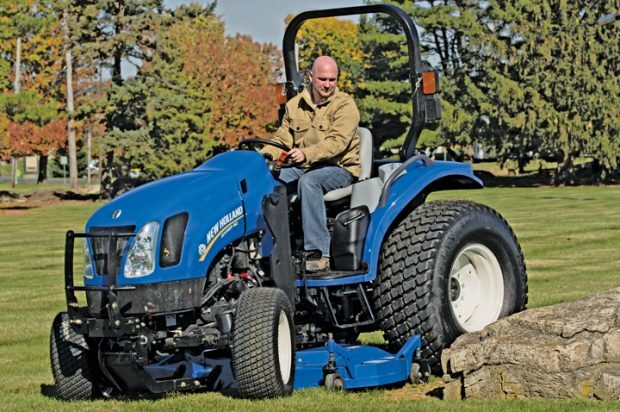 With the exception of Boomer 24 tractors, Tier 4-compliant diesel engines provide the power needed for loading, mowing, digging, blowing snow, tilling and much more. Boomer 24 models are equipped with a two-range hydrostatic transmission and an independent, electro-hydraulic 540-rpm rear- and mid-PTO. Boomer 33, 37, 41 and 47 models feature the choice of a smooth, synchronized gear transmission or a three-range hydrostatic transmission with dual pedals (one for forward, another for reverse), which provides for easier change of direction. A 12×12 synchronized shuttle shift (SSS) transmission (Boomer 33 and 37) or a 16×16 SSS transmission (Boomer 41 and 47) makes it easy to repeatedly shift back and forth between forward and reverse, perfect for loader work. These tractors also come equipped with electro-hydraulic PTOs and high-capacity, dual-pump hydraulic systems for steering and implement response. New Holland’s Boomer 46D/54D compact tractors (46 to 54 hp) with the optional SuperSuite cab usher in a new level of compact tractor comfort with the largest compact cab in the industry, says the company. The factory-installed SuperSuite cab provides a quiet and comfortable retreat for efficient year-round operation. All D Series compacts are equipped with New Holland’s exclusive EasyDrive CVT transmissions. With an electro-hydraulic shuttle mounted under the steering wheel and a single go pedal, this programmable transmission is simple to drive and can reach speeds of 18.6 mph. The Workmaster 33 and 37 compact tractor models are the latest addition to New Holland’s value class of tractors that bear the same trusted name. First popular in the 1960s, the original Workmaster models were known for their dependability and value. Today, it’s no different. For more information, visit newholland.com/na.